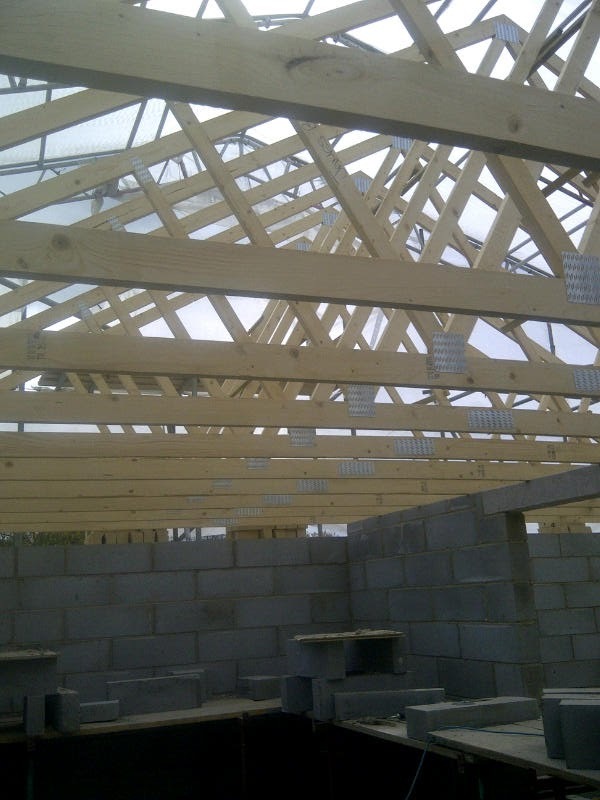 The Self Build Diary - Day 200 - Rain, Rain Go away! So the weather in the first week of July has been dreadful!! rain nearly everyday this week would have caused some delays each day, and the deluge that we had on Friday causing flood alerts all around the area, would have washed away meters of hard work on the pointing. Thank heavens for the tent which still continues to save us time from weather, next week it starts to come down and we will be fully glazed and secure! This week was all about the kitchen. The fitters came in and started to fit the kitchen, most of it is done now, and we are awaiting the stone to be cut for the work tops. I put a CAD drawing on of our kitchen back at the beginning of the blog and it looks uncanny! 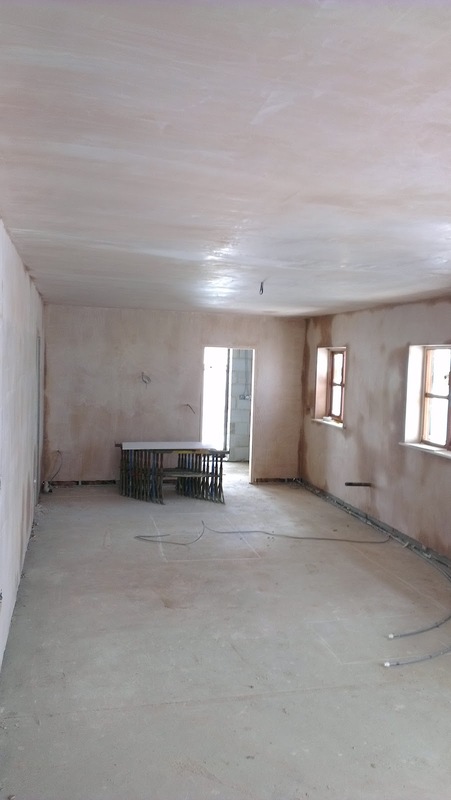 A couple more rooms have been plastered and we should be through the most of the plastering by the end of this week. I spent the weekend cutting out the electrical boxes in the plaster work. a really easy but time consuming job, a great way of getting involved and saving a few pounds in electricians labour costs. I also painted the kitchen/family room which is the largest room in the house, it took all day Sunday but it has made the whole project feel closer now! All that needs to be done to complete that room is flooring, glazing, second fix joinery (Architraves and Skirts) and some interior doors hung, which makes it feel like we are getting somewhere! So a busy weekend, This week is about plastering, glazing and getting secure so that the tent can come down and we can finally see our house the week after! The Self Build Diary - Day 192 - The Business End! Well another big catch up, in this post I promise not to make any rash promises to update the blog more regularly, it has been so busy, finding the time for everything has been difficult! Here is whats gone on since our last post. 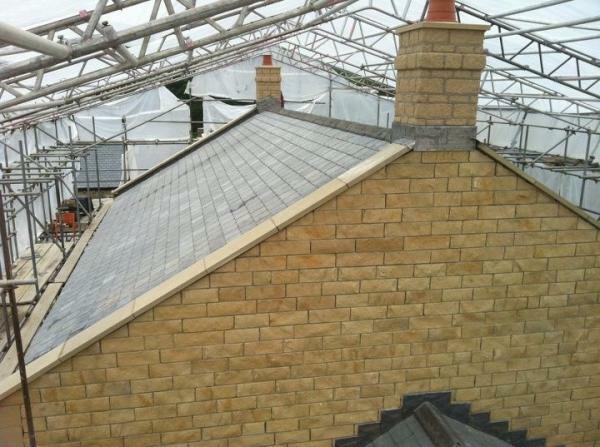 The roof was finished and the chimneys installed. The chimneys are Glass Reinforced Plastic (GRP) and weigh less than 30kg each, they come to site as you see them in the picture and are fixed in place to the masonary, the ﻿leadwork that Abode (Our Builders) have done is fabulous and you really cant tell the difference, even at this height, between the real stone and the GRP. We chose to use GRP very early on in the build, the chimneys on the main house section are dummy stacks and the plans originally had chimney breasts in the house to support them, which seemed like a huge waste of space in the rooms below. We started looking at the options to remove the chimney breasts that supported the chimneys, whilst retaining the the chimney stacks for the planning pwermission. we had three options. we could build the chimneys out in the loft on supports and have them made of the same masonary as the rest of the house, we could have a lightweight chimne similar to the GRPs with thin slips of the stone facings to match the rest of the masonary or the GRPs. We opted for the GRPs as the cost including the man hours to install them came out well under the other options. We also havent had much opportunity to use modern cutting edge techniques on a relatively traditional house design. So the whole of the house is built and the builders are on with pointing. The tent is performing fabulously in this "changeable" weather! the only downside is that we havent seen the house yet as its still covered up! We thought the tent would be once the roof is on and the windows in, but we have kept it on until the pointing is done. We are using a raised square pointing which is quite a local style of pointing, originally used to provide protection against the elements when period stone buildings were using inferior stone. Its not required but it looks great and sets off the fabulous brickwork and the yards of sawn stone detailing we have. So onto inside and my amature project management skills! The manufacture of our windows has been a bit of a pain as the manufacturer didnt deliver them in the 3-4 weeks that he said it would take, no9te to would be self builders, ask for and set a deadline, to be fair i should have ordered them earlier but its the first time ive done this and im not going to be too hard on myself! We got the first batch delivered last weekend and another batch on thursday, most importantly we got the kitchen windows which we were desperate for as we didnt want to miss our kitchen fitting slot (more on the kitchen in a minute. Twelve windows went in last week, including the kitchen, and to be honest they look great, they were well worth the wait. They are robust, detailed and are exactly how we imagined they would be! So the windows went into the kitchen in the nick of time, the kitchen gets delivered on Monday, fitting starts tuesday! so the plasterers rushed to get the kitchen skimmed ahead of boading out some of the other rooms. The kitchen looks spot on now its plastered. What amazes me is that the more materials you put in a room the bigger it feels! So the plaster will dry out this weekend, and ill seal the room off with polythene tomorrow and pop a dehumidifier in whilst the kitchen is being fitted, just to ensure that excess moisture doesnt damage the kitchen units. Elsewhere, the underfloor heating on the upperfloors has been installed, it sits above the floorboards in a "siccus" system which is basically strong polystyrene with chanells cut out for the elements and pipework, its a great way on installing a wet UFH system on a wooden joist floor construction. We then boarded over the UFH membranes with 18mm chipboard floating floor, you can buy a concrete composite screedboard, but it is hugely expensive and im told the efficacy of the screedboard isnt worth the 700% price increase on 18mm chipboard. Jobs for this weekend include putting some woodstain on the window frames finishing quite a few unfinished jobs and my weekley site tidy! Its amazing how much time i have spent tidying this house, if you ask Mrs G its not something im used to doing at home! Next week the kitchen fitting starts, the plasterboarding continues, ready for the plastering gang to skim the house the week after, more windows will go in and the oak frame for between the kitchen/family lounge and the hall gets installed. its all go! are we still on target for my overly ambious end of July moving in date???? possibly but we may well just take our time and creep into August, we havent given notice on our rental property yet and i think the most diligent thing to do would be to wait until we have got the plastering done, the eletrical and plumbing second fix is on its way and we have some stairs and glass before we do that, that will give us the first two weeks of august to make sure we are comfortable when we move in rather than have things going on around us? will i be upset if we dont move in in July, my arrogance says yes but actually if we only end up 2 weeks over my ridiculously ambitious deadline set before we even got out of the ground, i think wcan consider that a result, however we still have a lot to cram into the next 4 to 6 weeks so lots can still go wrong. The number of days in which work has been completed on the site that wouldn't have been worked until the building had a roof on or windows in, this is number of days per trade and doesnt represent man days, if the plumbers have had 3 guys in for a week i have counted this as 5 days, essentially we would add this number of days to the end of the build in a conventional schedule , although we have the roof on the house, until there are windows and doors some things (Not all) wouldnt be able to be completed. The Self Build Diary - Day 174 - One Big Catch Up! Well its been a fortnight since my last post. The family and I have had a weeks holiday which was a really nice break from site and to spend some catch up time with the family! its been almost 10 weeks of weekends on site and work in the week, and some family time before we head into the busy final stages of the build was just what the doctor ordered. So a week away and a return to site just in time for an extended Jubilee weekend to catch up on bits and bobs. The house has changed so much in the last fortnight. 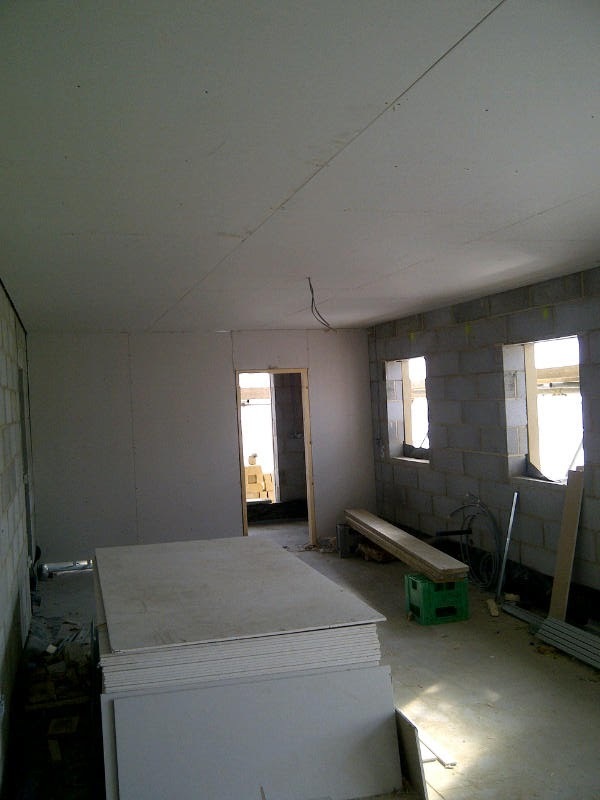 Most of the stud walls have plasterboard on and those that do not have insulation packed in, so you really get a feel for all of the rooms. All of the door casings are in place and first fix electrics and plumbing are all in place and complete throughout. 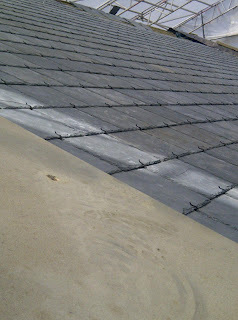 The builders are cracking on with the shell and have already put a massive dint in slating the roof. This is the best photo i could manage in the confines of the tent roof! So whats happening in the next few weeks. The underfloor heating is being installed on the upper floors and this weekend ill be boarding over the underfloor heating to protect it from damage and to provide us with our completed floor structure for the upper floors. Next week the plasterers return to complete the boarding and start with the dot and dab boarding on the masonry walls. Hopefully we will see some windows for the ground floor and they can be installed so that the plasterers can at least skim the kitchen, ready for the kitchen fitters in a couple of weeks or so. Anyway this was always a quick catch up and ill be back In a couple of days to give you some updates on problems and decisions and other bits in more detail! Tent counter is truly brilliant reading though! we would be looking at doubling our build time without the tent as things stand! God bless the tent! The number of days in which work has been completed on the site that wouldn't have been worked until the building had a roof on or windows in, this is number of days per trade and doesnt represent man days, if the plumbers have had 3 guys in for a week i have counted this as 5 days, essentially we would add this number of days to the end of the build in a conventional schedule. Well the roof trusses went on on Tuesday on the main part of the house and i had a truly busy weekend preparing for various trades and keeping plates spinning. I have stud worked the 2nd floor, Concreted a recess left in the flooring for the hearth and fireplace, Insulated some of the ceiling, had a good old fashioned tidy up and completed the media cabling through to the new stud walls. So its just the gables for the builders to do now and all the stonework will be completed, the builders are now out of the house and the trusses should be felted by the end of next week. the top floor last week, before i partitioned it off, it is remarkable that the more materials you put into a house the bigger it feels! 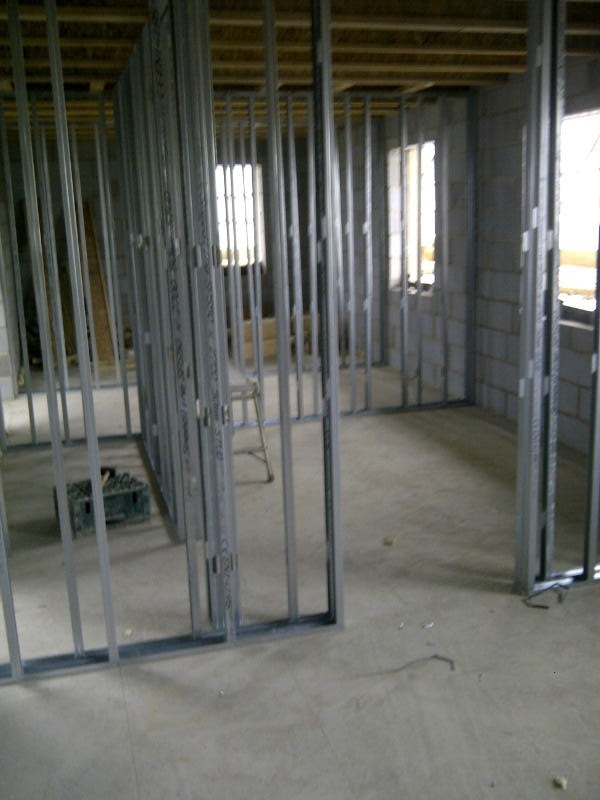 And its a great example of pile the materials in and the room feels bigger! The plumber and electrician are back on Thursday to complete the first fix throughout the house and then the plaster can crack on an fix plasterboard wherever he pleases, within reason! On Saturday Dan and Adrian from www.vacpoint.com came and fitted the first fix for a built in vacuum system. This was something that we saw at the Home building and renovation show in Harrogate last year and we thought it sounded like a good but over budget indulgence. Anyway we looked at it and the first fix of a system like this is remarkably inexpensive! The guys were in and out in a day and they fitted the full first fix. We can then do the second fix in the future whenever we decide to or whenever we can afford. but the system is there and ready to use and will be a great selling point if we ever decide to go down that route in the future! As someone commented today "I don't know why they don't put the ducting in all new houses! Ill update you before the end of the week and then I'm going to have a well deserved week off! Tomorrow will be a truly momentous day, and i thought i should drop a short blog post to let you know. It was confirmed today that the provisional booking for a crane to pull the trusses into place for the roof has been confirmed and by the end of tomorrow we will have a roof structure! 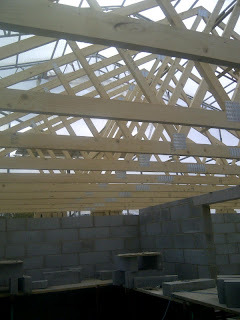 Ill be back to you on Wednesday with some photos of the trusses in action! This weekend I spent the weekend cabling the house with miles of Cat 5e and Coaxial cable that we may or may not ever use! each bedroom and reception room has been wired to a central point for 2 audio and visual and it will then be plastered over and no doubt forgotten about, but in the future if and when we decide to we will be able to use the structured network to fire all kinds of signals around easily and efficiently! I even ran some speaker wires into some of the ceilings in case we get the urge to have structured sound, and i also put wiring into the lounge for a surround sound system. This might have been a wasted weekend and a waste of a couple of hundred quids worth of cable, but....... it may turn out to be one of the most important things we have done in the future to give us the flexibility of using the house the way that we want to. This self building lark is tough, not only have you got to make a million decisions regarding how you want the house to be when you move in but you really have to think how you want it to work in the future too, that's tough! so the trusses should be in on Tuesday, fixed on Wednesday and the builders will crack on with one of the gables for the rest of the week. This weekend i have a lot of jobs to do, most importantly the stud work on the 2nd floor. The chaps at http://www.vacpoint.com/ will be coming on Saturday to install the first fix for a central vacuum system, its not something that we can afford at this point but if we get the first fix in, for the relatively low cost of the first fix, we have the option of doing the rest in the future when the cash flow returns. These systems are great, they will become more and more common in the future and are extremely convenient and great for those with allergies, its one of the few things that Mrs G has had her heart set on. Well since the last blog post, things have continued at their ever rapid pace! The builders (Abode - http://www.abodebuilders.co.uk/) have brought the extension up to the corbels and kneelers, i didn't know either, but it is the sawn stone detail at the roof line. 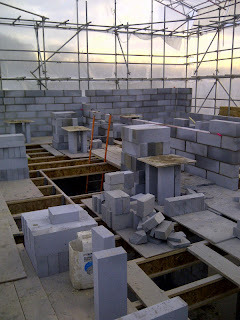 The main house is up to sill height in stone and the window recesses are in in block work. 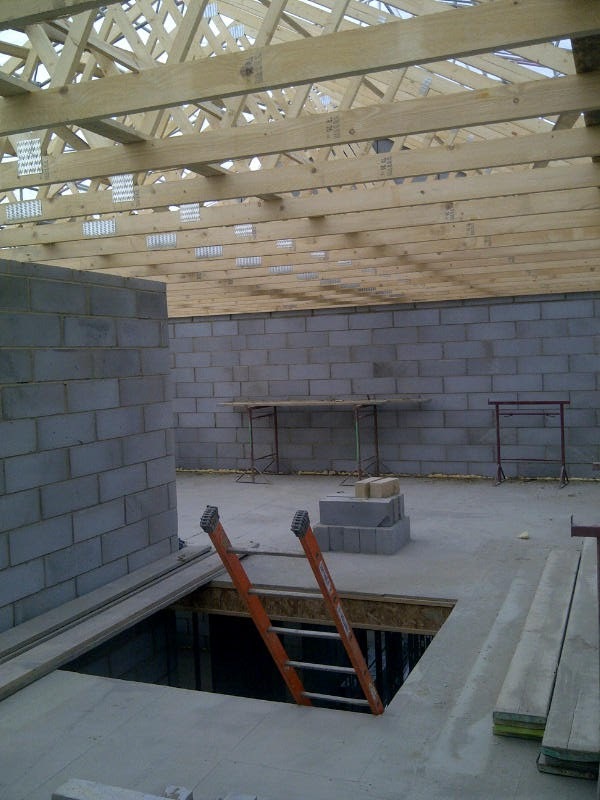 They have a busy week ahead to get the walls to roof line and enable the trusses to be craned in next Tuesday. Please don't underestimate the sheer amount of time we spent just moving things around! He then returned to assist me with stud work to the 1st floor, all 35 linear metres and we had very few hold ups. The builders merchant that we use mostly (James Burrell - In Ossett) recommended the speedline stud walling rather than using timber framed walling. the galvanised steel stud is easier to assemble and fit, its straighter and i think cheaper than a like for like wood alternative. This the back of the first floor and splits it into 5 rooms, a bedroom, a dressing room, two bathrooms and a line/boiler cupboard. So another full weekend on site, all day Saturday and Sunday, i was very pleased to receive a visit from a helper late on Sunday who wanted to inspect the size of her new bedroom. 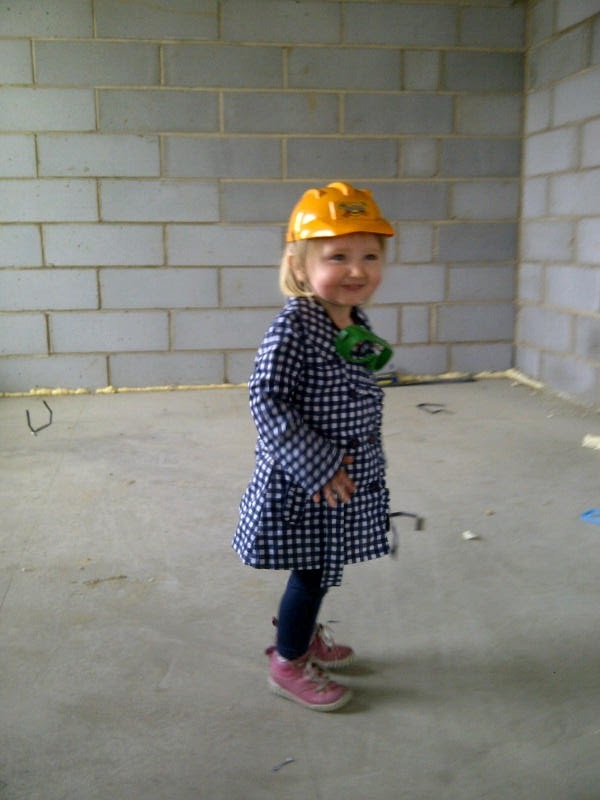 This is my daughter Chloe, who insisted that she be bought a hard hat an goggle set so she can go and help daddy at the new house! I thoroughly enjoyed a day off with the family today on the bank holiday! 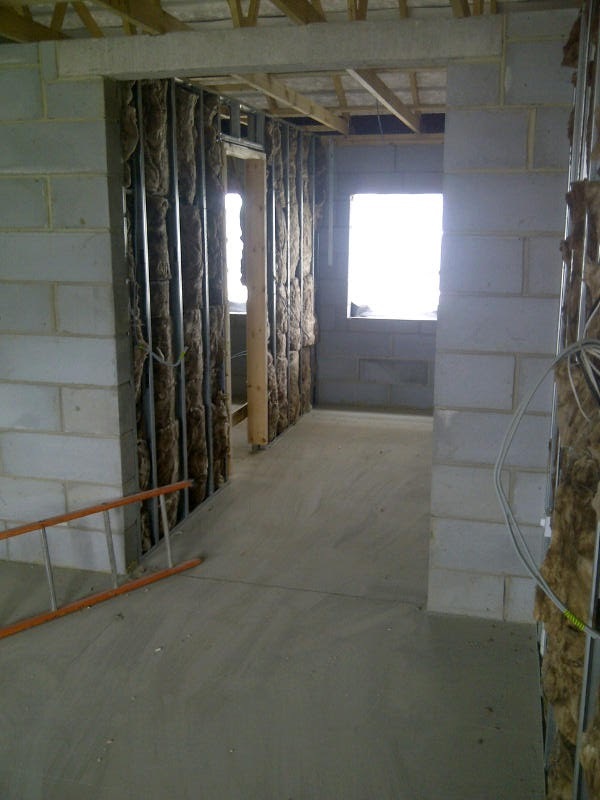 Electrician and plumber in this week first fix on the ground and first floors. 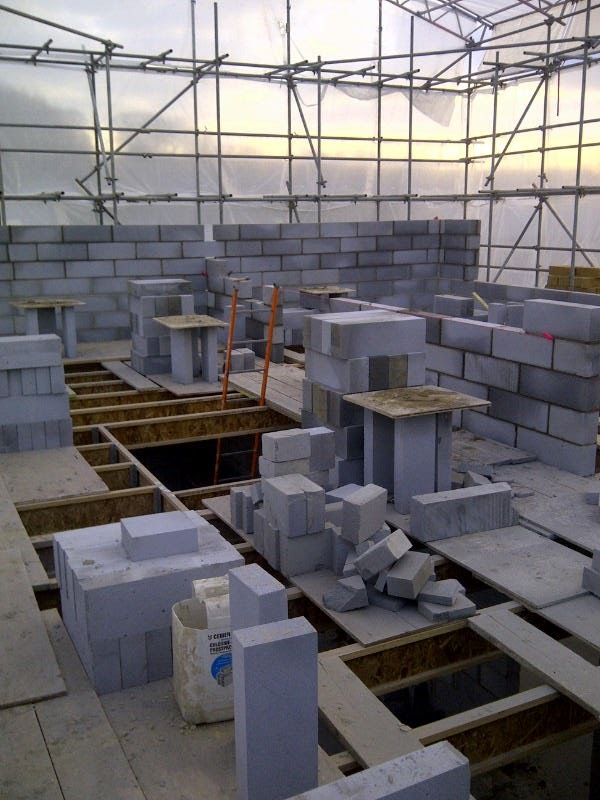 The Self Build Diary - Day 134 - A different house! Well Ive started to call it a house, not a site........ the place has changed so much in the space of 9 days! 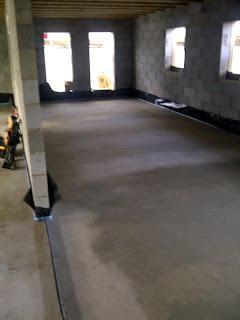 last time i updated you i had finished Insulating the ground floor ready for the underfloor heating guys to come in. 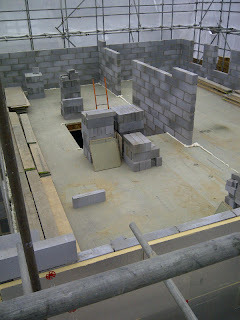 last Monday they came in and installed all the pipe work for the system on the ground floor. The manifolds will terminate neatly under the stairs, when there are in fact stairs! The sea of pipes was quite a sight to behold! 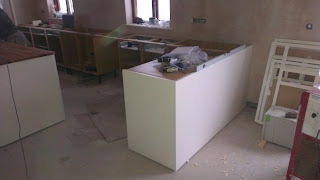 we have left gaps for some of the architectural fixings like the kitchen island the stairs, toilets. At this point i thought it would be prudent to photograph exactly where all the pipes are so that i cannot have the excuse in the future that i didn't know, when drilling or moving things. 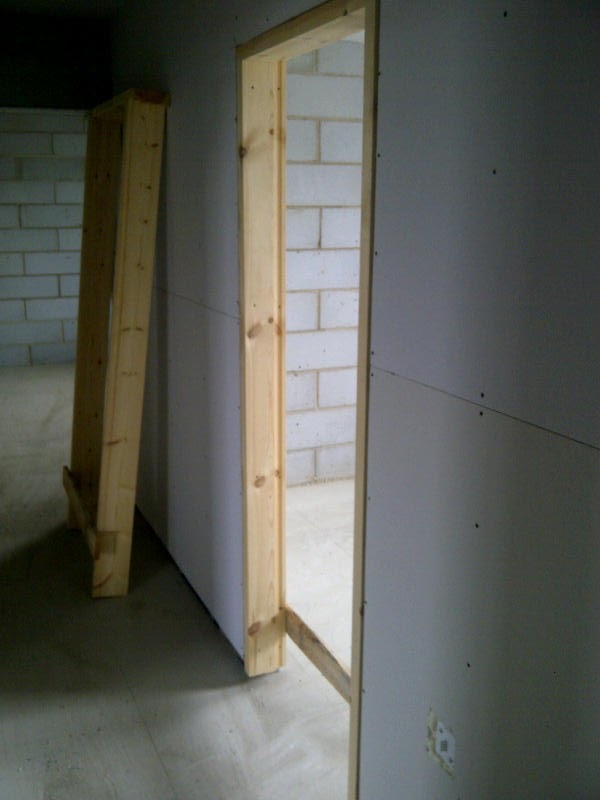 This proved one of the most useful exercises when i came to install the stud walls on the ground floor this weekend. I realised last week that i hadn't introduced the team of builders from Abode, our building contractors. Left to right we have Speedy Tom, French Kenny and Clever Luke. these guys are on site all of the time at the moment with cameos from their colleagues and other trades, they are very tolerant of my inexperience and are very helpful and supportive of my weekend efforts! The finish looks great, it is a fast curing compound which meant that it takes 2 days to dry enough for foot traffic and is fully cured and ready to take a floor finish in 7 days! we didn't need this speed but the curing times of a normal 65mm screed could be up to 2/3 months based on the atmosphere, so for the small extra cost we opted for the fast drying option. 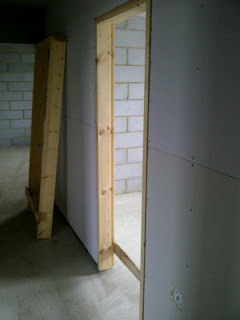 So last weekend, it was my first attempt at stud partition walls! 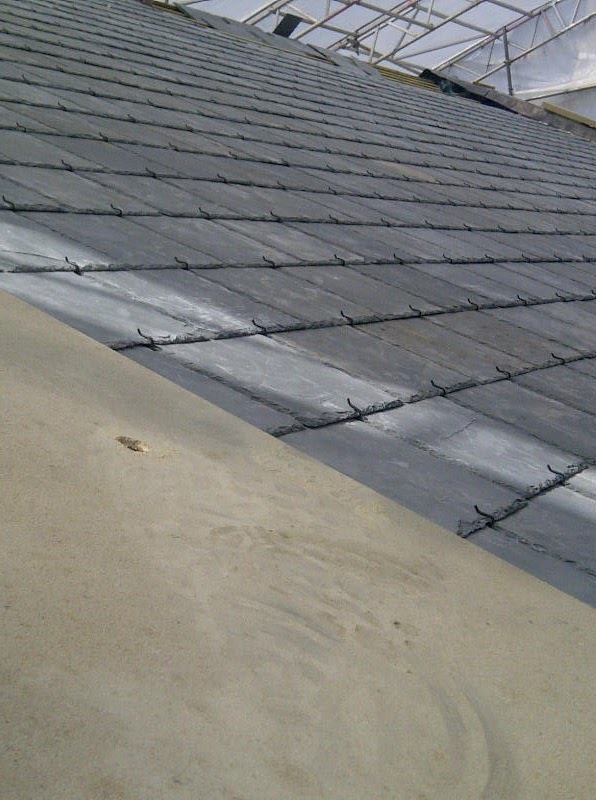 using Speed line galvanised steel studs, i aimed to get the ground floor studded last weekend and i made it! We are using double skinned walls, which will be plaster boarded on either side, there will be mineral wool through the middle and this will drastically reduce sound transfer between rooms. It will also create stronger thermal properties as there will be two independent unconnected walls. This section was the most complicated, here we have what will be the office and on the right a cloakroom and media hub. 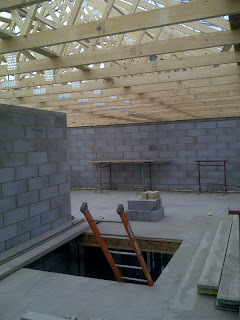 its been a busy week on site too! the guys have brought the block work up to form the second floor and by the end of the week most of the blocks will be up to head height of the windows, allowing me to board the second floor on the weekend..
Chipboad floor onto the top floor this weekend! ill let you know how we get on!